In December of 2006, shortly after The Magical Buffet launched, I wrote an article about the Wheel of Life. I found this visual roadmap to enlightenment fascinating and have wanted to revisit Tibetan Buddhism ever since. Well, hold onto your wheels Buffet fans because after roughly two years Buddhist symbolism is back! It’s time to look at the Wheel of Law. 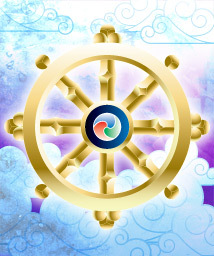 The Wheel of Law is also referred to as the Dharmachakra or Wheel of Dharma. Unlike the Wheel of Life, which is wheel-shaped and can been seen as making nods to the cyclic nature of humans, the Wheel of Law is a more accurate wheel in the fact that motion is implied by this symbol. Many Buddhists believe that the wheel’s motion is in accord with the evolution of Buddhism’s effects on humanity and the world around us. The Wheel of Law was first turned when the Buddha shared his original teachings in the Deer Park. This is where Buddha acquired his disciples and is why the Wheel of Law frequently is depicted with a deer on each side of it. However, just like the Wheel of Life, this wheel is a map to enlightenment. The Wheel of Law looks like a classic steering wheel of a ship with eight spokes. The eight spokes represent the Noble Eightfold Path of Buddhism: right view, right intention, right speech, right action, right livelihood, right effort, right mindfulness, and right concentration. The hub represents discipline and the rim, which holds the spokes, represents mindfulness, which holds everything together. This wheel is so important to Buddhism that before there were images of the Buddha, the Wheel of Law was used in artwork to represent Buddha. In fact, this wheel rates high enough to get its own mudra, a symbolic gesture used in Buddha images as well during Buddhist meditation or ritual to evoke particular ideas. The U.S. Armed Forces use the Wheel of Law as the insignia for a Buddhist chaplain. Buddhist chaplain? I gotta’ get me an interview with one of those! Circles, and images of circular things, are found everywhere symbolically, but when it comes to wheels, I think the Buddhists may be the kingpins of that particular circular symbol. Previous postWhat’s the Deal with “Watchmen”? Next postWhen It’s Just You and the Prince of Darkness, Only an Acme Will Do.